ViewSonic has built its PJ551D around a 0.55-inch DLP chip that offers a native resolution of 1024 x 768 pixels. It lets the side down slightly as the maximum resolution can only be stretched to 1280 x 1024 pixels, rather than the widescreen 1400 x 1050 pixels that is offered by more versatile rival projectors. The back of the ViewSonic has the smallest selection of connectors we have seen in a long time with a VGA input in the middle and S-Video and Composite connectors to one side. There's a USB port marked 'Service' and that's your lot. The PJ551D doesn't have a speaker, so there is no audio connection. The noise rating of the PJ551D is around the 30dB mark and is also rather noisy, but when you switch to Eco mode the edge is taken off whites and blacks, yet the noise level barely drops. If you constantly run the projector in Eco mode, the lamp life only increases from 3500 hours in Normal mode to 4000 hours in Eco, which is such a small difference that it is unlikely to inﬂuence anyone. This pain-without-gain means that we recommend you stick to the noisy Normal mode. The credit card remote is so small that at ﬁrst we couldn't ﬁnd it in the box, which sounds silly but we were looking for a regular TV or Hi-Fi remote. Once we'd found it we had a grim time as the remote is very ﬁddly and the rubber buttons are imprecise. You can get round this by using the control buttons on top of the projector, but there's no avoiding the fact that the set-up menus are poorly arranged. 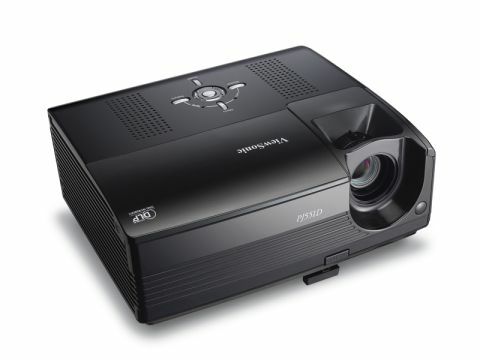 This is a cut-down, no-frills DLP projector with a low price. However, we found more highly-specced rivals discounted to the same price, so the PJ551D doesn't have a killer advantage on that score. It's a competent projector that does a reasonable job, but it lacks any interesting features and failed to make a lasting impression.